For Red Schoolhouse Maple in Palermo, the early onset of warm weather is more than a chance to shake off the winter months with spring sports and by breaking out the shorts. Like other maple syrup makers, the business of production is at the mercy of the weather wherever a producer is located. And for those in Central New York, sometimes the season can be a bit unpredictable. Maple trees in the woods behind Red Schoolhouse Maple on a collecting system. 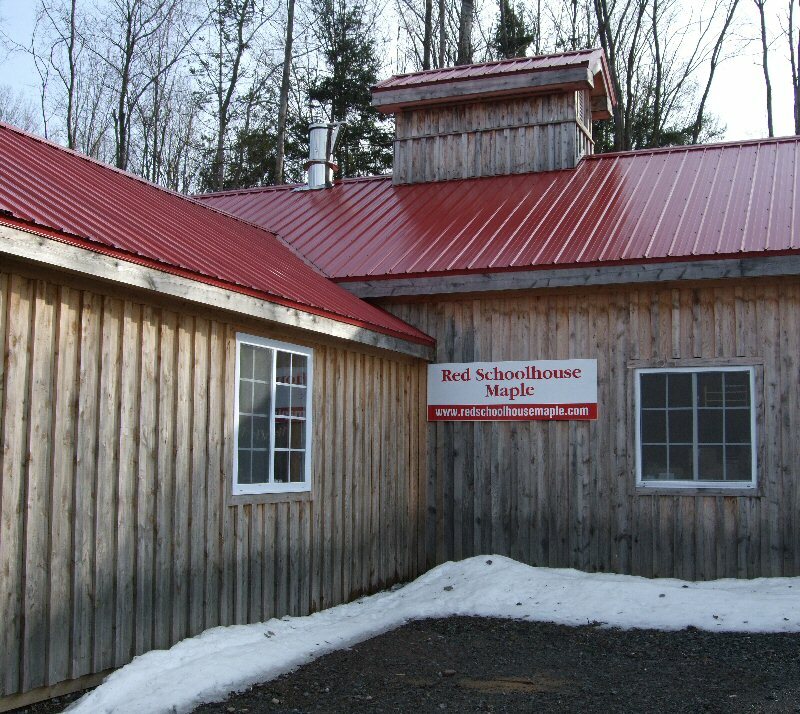 Red Schoolhouse Maple is one of three producers in Oswego County that are members of the New York State Maple Producers Association taking part in the 17th annual Maple Weekends this year. Along with Maple Hill Farm and Maple Hollow Farm, both of Hannibal, the producers get involved in the event to celebrate the process and to provide a fun and educational event for families. 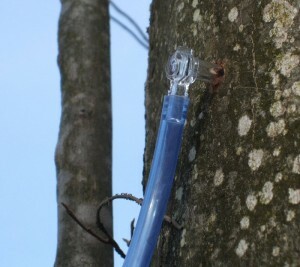 A close-up of one tree used to collect sap. At their location, Enders explained, they do things a little differently than some other producers. The sap collected goes into the main building, the sugarhouse, through tubing and is collected in a releaser, which fills up and pumps sap into a holding tank. 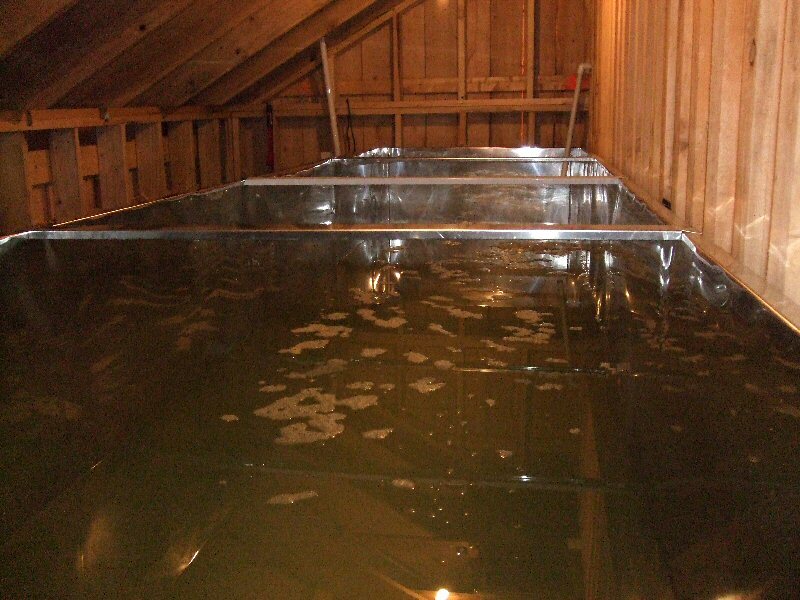 The holding tank, Enders said, holds 1750 gallons. The process has been moving along swiftly with the warm weather. “Up north it’s mostly still too cold,” Enders said. Generally, the maple season lasts from 4-6 weeks, usually through March with a week or so in April. The Enders were able to begin about two weeks early this year. 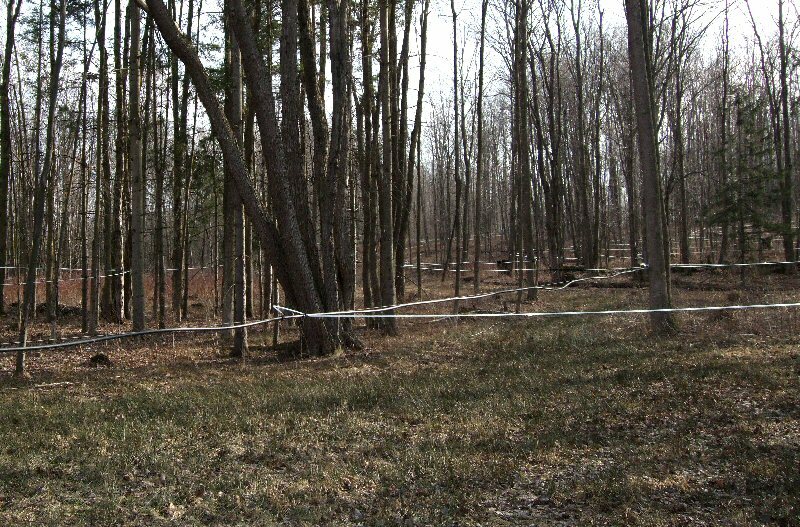 Enders went on to explain that a 45-48 degree day with temperatures from 25-30 degrees Fahrenheit at night “creates pressure” in the trees that causes the sap to draw out easily. When the sap first comes into the building, “it’s about 98% water and 2% sugar,” according to Enders. A holding tank used to collect sap inside the sugarhouse. Their process uses a reverse osmosis machine to take the water out of the sap, a newer technology that not all producers use. And when the production season is over, nothing is left year-around in the trees used for collecting. The trees need time to heal to be used for the next season, and producers are careful to not damage their carefully tended plants. 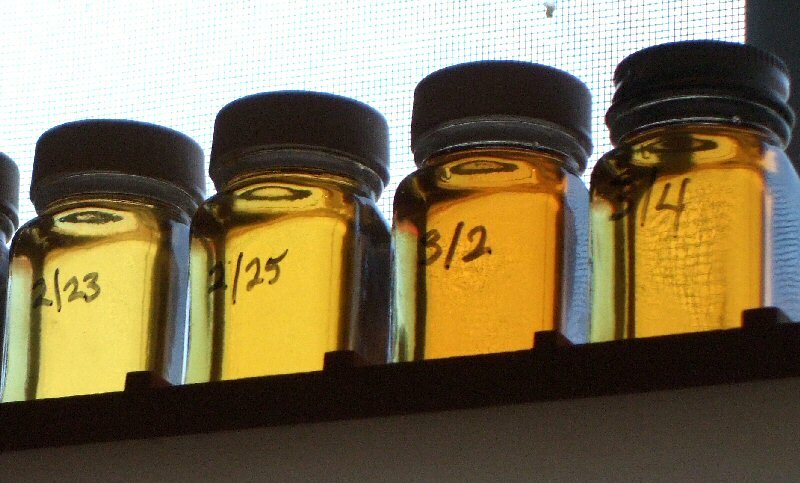 The syrup produced tends to go from light to a darker shade by the end of the season, and Enders commented on a common belief of the syrup produced throughout that time. Recently produced and dated syrup. Note the differences in color over time. 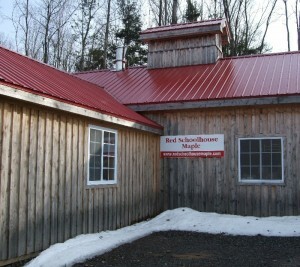 Red Schoolhouse Maple is in a third season of operation, and began with 1750 taps. The producers now boast around 2,250 taps this year and the end result is an array of products beyond the typical jug of syrup. From maple cotton candy to a barbeque spice, along with the popular staples such as maple cream and maple candy, local maple businesses do more than just make and sell syrup. Enders admitted to being a little worried about the first weekend of the Maple Weekends event falling on the same weekend as St. Patrick’s Day. But as an event with plenty of activities for kids (face painting, story books on hand about maple syrup, and a sled dog team brought in from Kindred Moon Kennels), and something for the whole family to enjoy, a pancake breakfast before the tours, she is optimistic about the turnout. Carissa Lago, a self-proclaimed “helper” at the Enders operation, is excited for the upcoming event that Red Schoolhouse Maple and other local producers are taking part in. 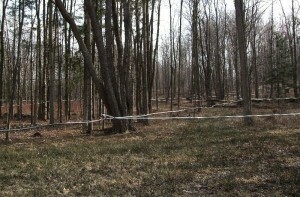 Red Schoolhouse Maple in Palermo is one of a few New York State Maple Producers Association producers in Oswego County. 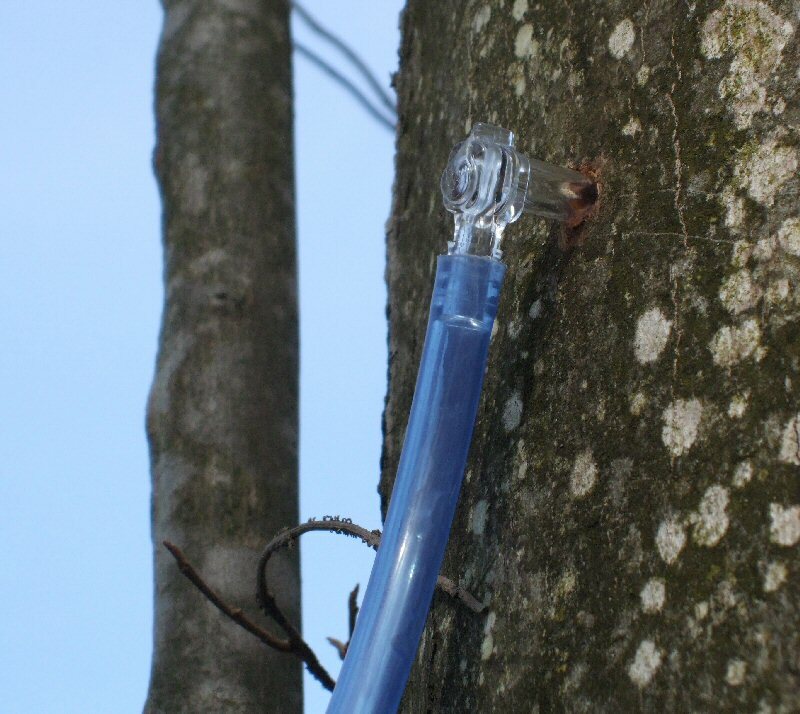 To support area businesses and to learn more about the maple syrup production process, head to one of the three participating producers in Oswego County the weekend of March 17 and 18 or March 24 and 25. Tours will be hosted from 10 a.m. to 4 p.m. at Red Schoolhouse Maple, 2437 County Route 4, Palermo, Maple Hill Farm, 86 Guernsey Road, Hannibal, and Maple Hollow Farms, 1309 County Route 85, also Hannibal. The event has grown to a state-wide celebration of the maple sugaring process.